The price of silver could be setting up to soar. Don’t ignore the gray precious metal. It could reward long-term investors immensely. You see, the silver market and the stock market have an interesting relationship. Look at the chart below. It shows silver prices at the top. At the bottom of the chart, it shows the 60-month correlation between the S&P 500 and the silver market. This correlation is saying something amazing in favor of silver. For long-term readers of Lombardi Letter, this chart shouldn’t be anything new. You see, whenever the correlation between the S&P 500 and silver becomes extremely negative, nearing -1, we see a bottom in the silver market. 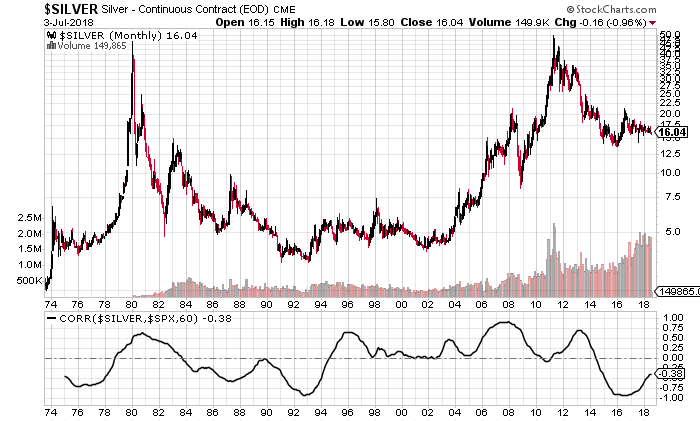 In the chart above, look closely at what happened to silver prices in 1976 and 1993. In both of these instances, a bottom was formed in silver and a massive rally followed in the next few years. In both of these instances, silver started to move up slowly and then make rapid moves to the upside. Fast forward to 2016: the correlation between the stock market and the gray precious metal became almost inverse again. Do we have a bottom in silver prices now? Bottoms and tops are impossible to predict, but the relationship between silver and the S&P 500 suggests that we may have seen the worst in the silver market already. What’s next? We are seeing the correlation starting to trend higher. When this happened in 1976 and 1993, we saw bullish sentiment build in the silver market, and prices started to move higher. If we are to assume that silver could do what it has done in the past, bullish investors should get ready for massive upside in the coming years. Dear reader, I can’t stress this enough: Don’t ignore the correlation between silver and the S&P 500. It’s saying that a bottom could be in, silver could be headed much higher, and getting some exposure to the metal may not be a bad idea for investors. After the relationship between silver and the S&P 500 inverted in 1976, the gray precious metal price went from around $5.00-an-ounce to around $50.00 by 1980. This represents an increase of 900%. Then the price went from under $4.00 in 1993 to near $50.00 by 2011. That was an increase of 1,150%. If we assume that similar gains follow in the coming years, we could be looking at a silver price in the triple-digits. With that said, it may not be a bad idea to look at silver mining companies. Over the past few years, miners have been severely scrutinized by investors. They have become lean and mean now. A lot of the miners have reduced their costs, improved their resources, and built up cash on hand. In the next bull run, silver mining companies could be going in as a well-run business. So, I believe that a lot of miners could provide investors with immense returns. We are talking two to three times the return of silver. I will end with this bold statement: If silver prices surge, silver mining companies could become the next millionaire makers.